In a rematch of last year’s Div. III championship game, No. 9 Tufts (20–3) traveled to No. 1 Amherst (22–0) on Friday with hopes of avenging that loss and overthrowing the hosts as the top team in the NESCAC standings just weeks before the conference tournament. Despite a second half rally, the Jumbos fell to their Mammoth rivals, 50–43. Tufts resumed its winning ways the next day at Hamilton, never trailing en route to a 69–53 rout. Tufts is now 20–3 overall and 7–2 in NESCAC play with just one game remaining in the regular season. With a night to reflect on the defeat at Amherst, Tufts came out firing against Hamilton on Saturday. First-year guard/forward Emily Briggs’s layup at the 8:20 mark of the first quarter was the first score, and Tufts never trailed for the remainder of the game. Taking a slight 11–9 lead into the second quarter, the Jumbos applied defensive pressure, holding the Continentals to just seven points in the period. Just over a minute into the second quarter, senior forward Melissa Baptista rejected Hamilton junior guard/forward and co-captain Halie Serbent’s attempted layup and finished the play on the other end with a jump-shot. Briggs contributed eight points in as many minutes, while Tufts limited Hamilton to 3-of-16 shooting in the period to open up a 24–16 lead at halftime. Tufts started fast after the break, as Baptista and the team’s co-captains — senior guard Lauren Dillon and senior guard Jennie Mucciarone — dropped in two unanswered layups and a three-pointer. With Tufts nearly doubling Hamilton’s score at 31–16, the game appeared all but decided early in the third period. However, Hamilton coach Michelle Collins called a 30-second timeout to revive her team. Hamilton immediately scorched Tufts on a 15–3 run and cut the deficit to just three points at 34–31. The red-hot Continentals appeared ready to take their first lead before the Jumbos applied the brakes with three minutes to go in the third. A jump shot from junior forward Katie Martensen, followed by buckets from Dillon and Baptista, poured ice water all over Hamilton. 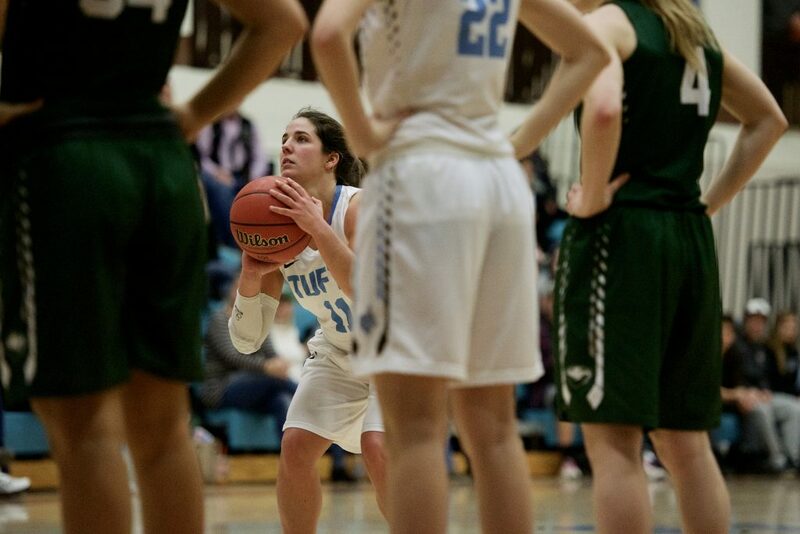 Junior guard Jac Knapp closed the period with a jumper, and Tufts’ lead was once again intact at 44–32. The teams traded blows in the fourth quarter, but Tufts again outscored Hamilton and finished on top, 69–53. Though the Jumbos came away with the win, Baptista felt there was room for improvement going forward. Briggs contributed a career-high 20 points to go with five rebounds and two steals. Dillon, the shortest player on the team, paced Tufts with nine rebounds and added 15 points, including a trio of treys. Baptista scored 17 points on 6-of-12 shooting with two blocks and three assists. Since the Jumbos claimed a NESCAC Championship in the 2014-15 season, they have fallen to the Mammoths twice in the NESCAC title game and once in the Div. III national championship. In the last two years, Amherst has been a national semifinalist and the national champion, while Tufts has twice been the runner-up. Even their mascots, an elephant and a woolly mammoth, seem small when these two behemoths of women’s basketball meet. It is with this history in mind that the two NESCAC powerhouses faced off on Friday, a few weeks before the NESCAC tournament. Baptista started off the game with a layup, and Amherst sophomore guard Madeline Eck answered right back with a layup of her own. It was a defensive contest from the start, as the teams traded stops. The Jumbos could not find their offense, though, and the Mammoths jumped out to an early 12–4 lead. The period ended with Tufts trailing 16–10, and the scoring battle between Baptista and Eck had begun, as each posted six in the quarter. Eck struck first in the second period with an early layup, but Tufts leaned on Martensen to keep the game close, as the Simsbury, Conn. native answered with a jump shot and a free throw. Martensen went to the bench not long after, however, and Tufts went cold from the field. The Mammoths marched to a 30–13 lead before Berube called a timeout. Martensen checked back in and quickly scored a layup while being fouled; she converted the free throw for a critical and-1 play. Mucciarone’s three-pointer with 1:22 left was the last score of the period and the Jumbos entered halftime down 32–19. Tufts started fast in the third quarter with a layup from Knapp and a three-pointer from Dillon. The Mammoths seemed to be reeling, committing multiple turnovers and missing two sets of free throws. With just under four minutes to go, a layup from Baptista narrowed the gap to 34–29. With 13 points, it was Tufts’ highest scoring quarter, while it was also the hosts’ lowest with just seven. Baptista caught fire in the fourth quarter, as she went for nine of her team’s 11 points in the period. On the other side, senior guard/forward and co-captain Hannah Hackley tossed in four, and Amherst played Tufts to a draw with 11 points of its own. With under a minute to play, Tufts drew within three points, 46–43, but Baptista’s late three to tie did not fall, and Amherst hit its free throws to take a 50–43 win. Baptista finished with a team-leading 18 points and 13 rebounds in 38 minutes. Tufts was missing sophomore guard/forward Erica DeCandido to an ankle injury, which shortened the forwards’ rotation, resulting in an uptick of minutes for Baptista and Briggs, especially. Tufts travels to take on Trinity (14–8) on Sunday in its last regular season contest before the NESCAC tournament begins on Feb. 17.